Look everyone! It’s the Lesser-Spotted Pink Book Reviewer! You must all be very, very quiet or else she might take fright and scamper away before she’s actually gotten round to writing a damn review! About two chapters into reading this, I Tweeted something along the lines of ‘Wow, Catching Fire is nowhere near as good as The Hunger Games, is it?’ Because, you know, the first two chapters completely sums up the entire book and it never develops past that. Either that or I’m a moron. Probably the latter, as THIS IS JUST AS GOOD AS THE HUNGER GAMES. Babbly introductory paragraph aside, I loved this just as much. Before I started it, I was skeptical as to how Ms Collins could possibly send Katniss and Peeta back to the arena without making it a complete repetition of the first book. Without telling you how, or what happens, she does and does so very, very well. The other players are nothing like the set in The Hunger Games and nor is the situation or events that happen. The main characters, however, are remarkably consistant. Katniss, Peeta, Haymitch, Cinna… they all have the exact same personalities they had previously, although naturally they develop throughout. This book is a lot more political than the first – Katniss, Peeta and Haymitch have to deal with the ramifications caused by their rebellious escape from the arena in the last book. Katniss’ anxiety and constant paranoia is beautifully realistic, although she never explains the complete turnaround in her feelings for Peeta. She decides to try and save him but never wonders why or feels the need justify it when she supposedly doesn’t love him. The manner in which they end up back there is so predictable I’d guessed it within the first two pages, quite literally. But hey, it’s predictable because it’s a simple solution that fits. The best way I can explain it is that you can predict Wednesday will come after Tuesday. You know it’s going to happen, but you don’t mind because it just kind of works that way. This is the same – it just works and I can’t think of a better way it could have happened. The one thing that annoyed me is the same as in The Hunger Games – Katniss’ complete lack of emotion. She does a little better regarding Gale and Peeta – here you can almost believe she’s not made of stone. But regarding the brutal murders in the arena, the unfairness of the reaping and her injuries… she’s really not bothered at all. She doesn’t worry about injuring herself and she never freaks out when a friend dies or gets injured. I would have liked her to be a little more human in that respect, I think. But hey, what an ending! Not what I expected at all. I’m just glad I got hold of the books after all three had been published – I’d have been screaming the place down if I had to wait a year for the third book after that cliffhanger! 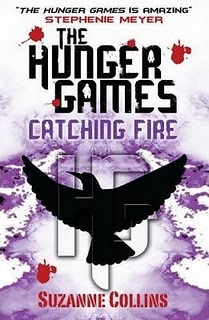 My review of The Hunger Games can be found here. I'm still not sure if I'm going to read this one. I read the Hunger Game and loved it but I'm soooo scared. I love all the characters sooo much! Fab review. Oh you should! I thought exactly the same as you, but it really is just as good. It's a different storyline too, so it doesn't feel like you're just reading a rehash of The Hunger Games. I really need to push this up on my tbr pile.